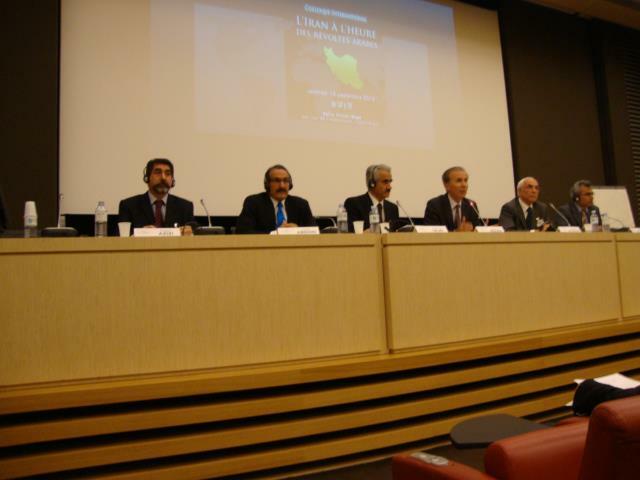 Life after the Iranian regime was the topic of debate at an Iranian federalist conference at the French parliament this month. The ground-breaking symposium was led by ethno-national parties representing the Kurds, Ahwazi Arabs, Balochis and Azerbaijanis who together comprise more than half Iran's population. Referring to the revolutionary fervour of the 'Arab Spring' of 2011, French Socialist MP Pouria Amirshahi told the conference that the Middle East was far more complex than portrayed in the international media. He stated that supporting the movement for change was a moral duty and had historical significance which is only just being understood. Gilles Riaux, a senior researcher the Strategic Research Institute of French Military School, spoke on ‘the reconfiguring of relations between the centre and the periphery under the Islamic Republic’ in the context of ethnicity in Iran. He spoke about the rising strength of ethnic movements, while other issues such as women's rights had failed to lead revolutionary change in Iran. Mr Riaux emphasised that non-Persian nationalities and ethnic groups did not fully support or whole-heartedly participate in the 'Green Movement' as its leaders had failed to address their aspirations. In his speech on ‘the evolution of Turkish-Iranian relations before and after the Arab Spring’, Professor Nuri Yesilyurt of Ankara University talked of the changing relationship between Turkey and Iran following a golden period of co-operation for a decade. As the relationship between the two countries has cooled, Turkey assumed the role of mediator between Sunni groups and Western powers during a recent series of ‘Arab Spring’ uprisings. Prod Yesilyurt claimed this would inevitably challenge Iran’s policy towards minorities in the region. 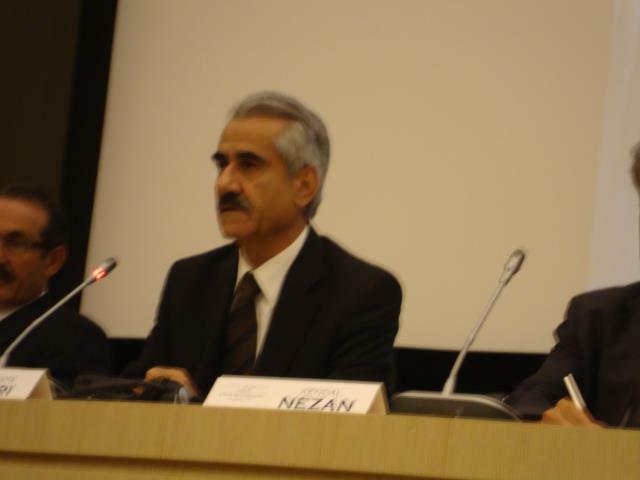 Kendal Nezan, President of the Kurdish Institute of Paris, reiterated the bias in the Western media towards covering issues related to Iran’s nuclear weapons, as opposed to more pressing concerns such as human rights atrocities against ethno-national groups. 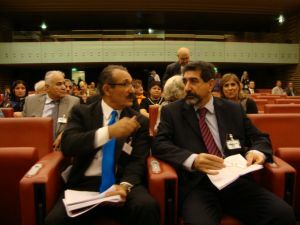 Nasser Boladei, First Secretary of the Baluchistan People’s Party, reinforced Mr Nezan’s view by pointing out the failure to report on the death sentence of nine Baluchis by the Iranian regime earlier in September. He believes that both the Iranian national and the international media, including Iranian human rights organisations, would have initiated a solidarity campaign had the death sentences been handed out to Persians. He also commented in detail about the nature of poverty and deprivation among the Baluchis of Iran, concluding that the Iranian regime’s silencing of an ethnically diverse population is pushing the country to a political fate that could potentially be worse than Syria or Yugoslavia. Hedayat Soltanzadeh, a leading member of the Democratic Federal Movement of Azerbaijan, highlighted the discrimination against non-Persian peoples during humanitarian aid following the recent earthquake in Iranian Azerbaijan. He said the outcome of discrimination was far worse than any consequences of international intervention in Iran. Dr Abdian further added that Ahwazi Arabs, who constitute about 10 percent of the population and live in an oil-rich region with 110bn barrels of oil reserves, have been put under political, cultural, social and economic subjugation for the past 87 years. These regimes have not only stripped the Arabs of Ahwaz of their basic human rights but have also treated them as second or even third class citizens in their own lands. The Ahwazi Arabs have endured one of the worst examples of brutal persecution and ethnic cleansing imaginable by the monarchist regimes of Pahlavis and the clerical regime of the Islamic Republic of Iran. Speaking on the right to autonomy, Yousef Azizi Bani Torof, Chairman of the Centre for Combatting Racism and Discrimination Against Arabs in Iran, pointed out the Islamic Republic’s outright rejection of the 12-point demands made by 6-7mn Ahwazi Arabs to the interim government of Mehdi Bazargan in 1979. He said that at the time, Ahwazi Arabs had demanded autonomy within the framework of the Iranian constitution. Given a chance, the Arab nation was willing to recognize and respect the Iranian constitution, but unfortunately the Ahwazi Arabs faced severe repression from General Ahmad Madani. Highlighting the injustice, gross inequality and discrimination against the Ahwazi-Arabs, Mr Bani Torof drew attention to the main rivers such as Karoon and Dez that have been diverted to Persian provinces while Ahwazi Arabs suffer from drought and lack of clean drinking water. According to an UN survey, Ahwaz City has been declared as the most polluted city in the world. Besides, it is also the seat of cultural repression with the Islamic Republic engaged in a xenophobic drive to substitute the Arabic names of cities and streets with Persian names. In the light of such basic human rights violation, Mr Bani Torof reiterated the political solution that has been presented by the diverse ethnic groups: the establishment of a federal system in Iran. Mr Bani Torof ended the session on a passionate note by stating that the anniversary of the 2005 Ahwazi Arab Intifada is honoured by many Ahwazis, who as a result are willing to endure detention, execution and unreported disappearance.